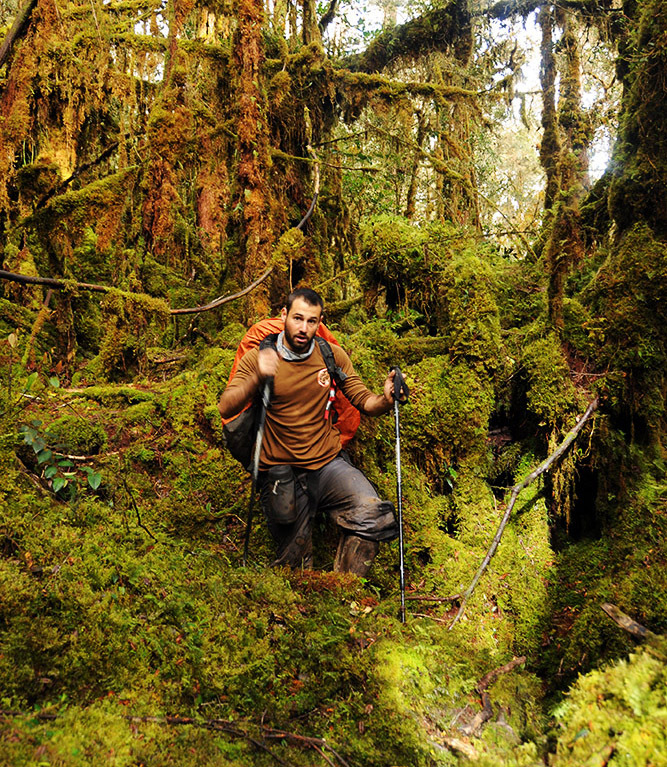 Bogota once had a scary reputation, but luckily those memories are in the past! It’s recovery has been pretty impressive, and I felt pretty safe the entire time in the country. 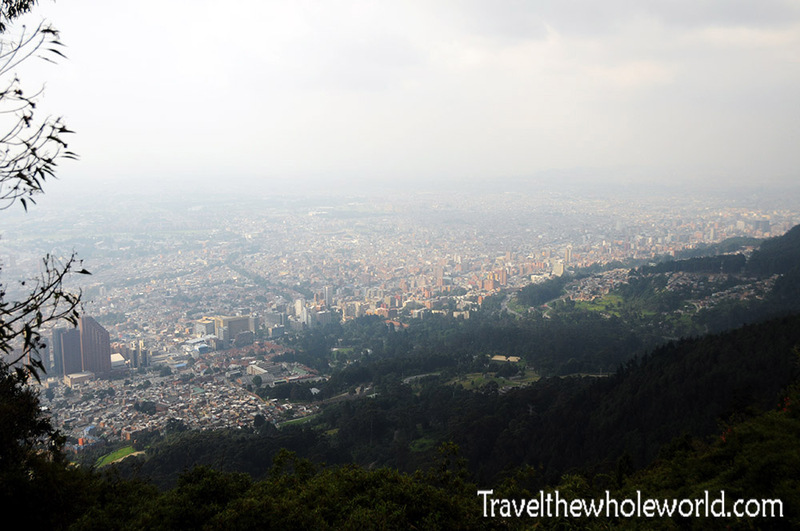 Bogota has rightly become a normal travel destination with easy access from the United States and plenty to see. I normally start each web page with a country’s national square or some famous landmark even though I might have visited it towards the middle or end of my trip. In Colombia though, Bolivar Square was actually the very first place I visited since it was only a block away from my hotel. I once had a photo of the cathedral on this page, but somehow it got erased from my computer when I tried to upload a higher res version… Not sure how that happened, but it wasn’t a photo I was proud of anyway! The cathedral was built in the early 1800’s, and I’m sure I’ll see it again one day. The photo above is the National Capitol building that was finished 100 after the cathedral in 1926. These photos above and below are from Simon Bolivar Square. A Friday morning visit took me to a large market that filled up the entire square. 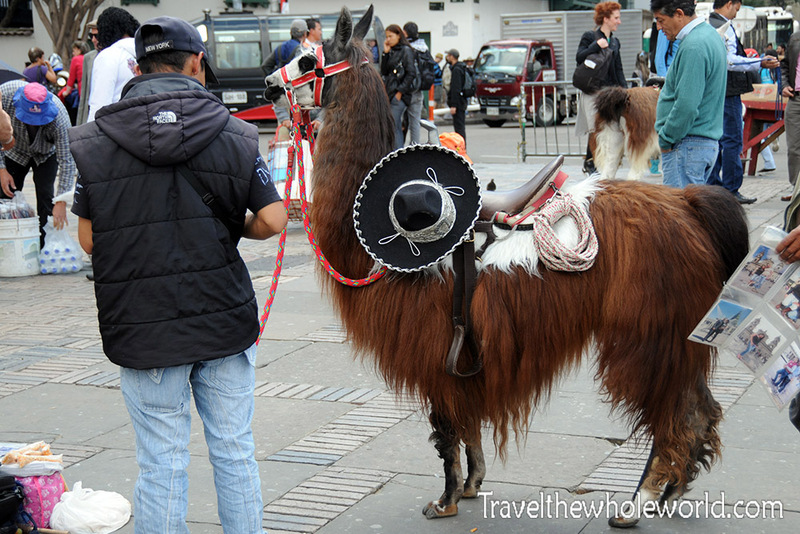 There were a ton of vendors selling all kinds of cuisine, artsts, a few dancers, and even some llamas. Most people gave me free samples and it was here in the square where I tried mura for the first time on this trip. I had mura berries and mura flavored drinks throughout my trip in Colombia. It appears that mura is the South American version of the blackberry, or maybe it’s the same exact thing but just called mura in South America! 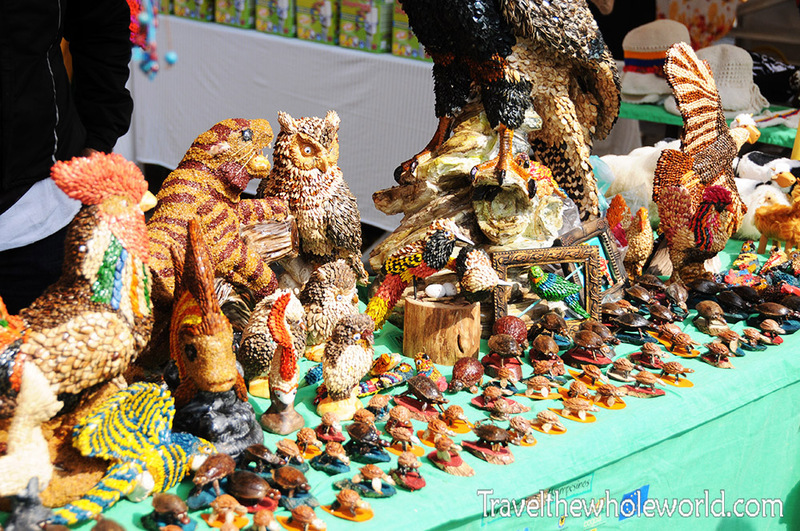 The photo below shows some animals that look to have been made of seeds that were glued together and painted. 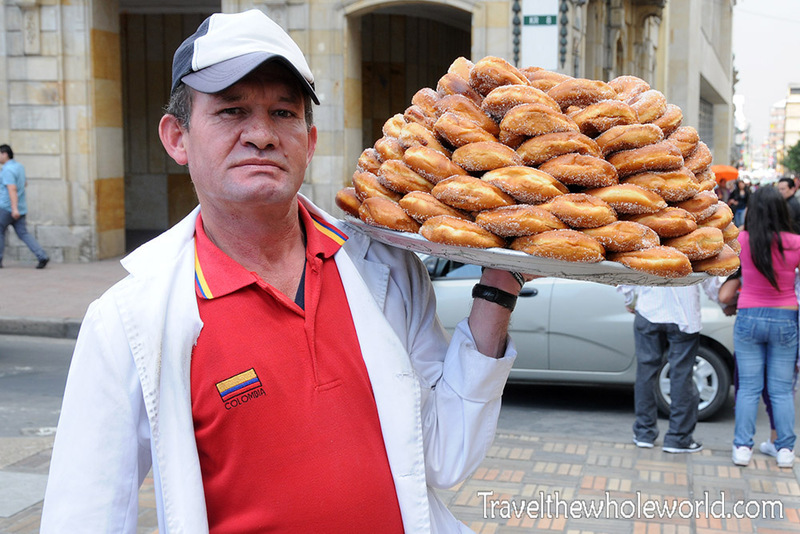 Aside from fruits I bought a donut from this guy since he was nice enough to let me take his picture. 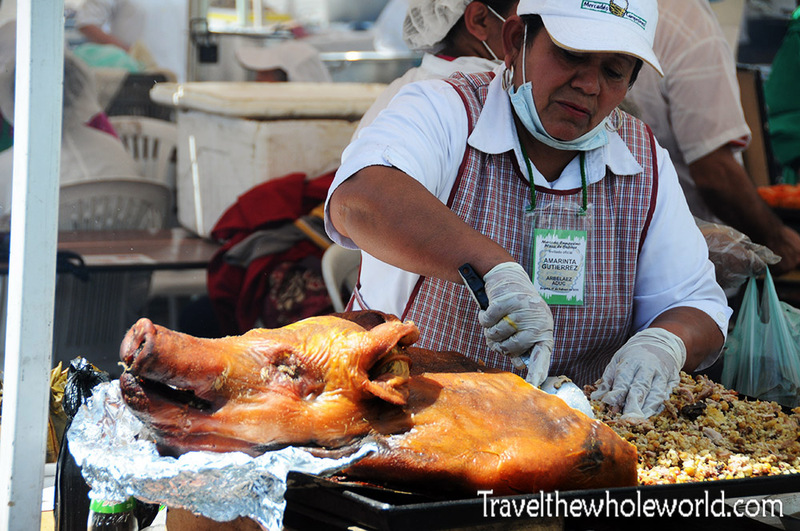 I also tried some other foods in the market, but refused this pork. Even though I’m not a vegetarian, seeing the entire animal dead and stuffed with other food wasn’t appealing to me. 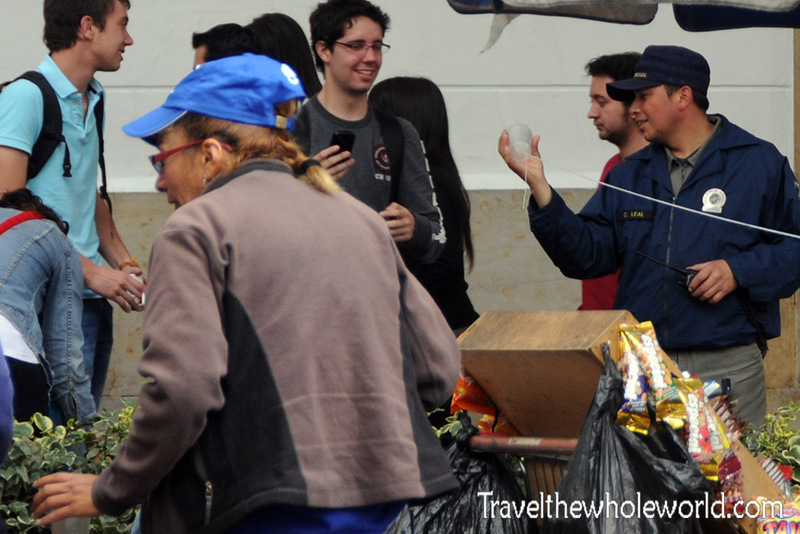 If food from street vendors in the market isn’t for you there are plenty of high end restaurants to choose from in Bogota. 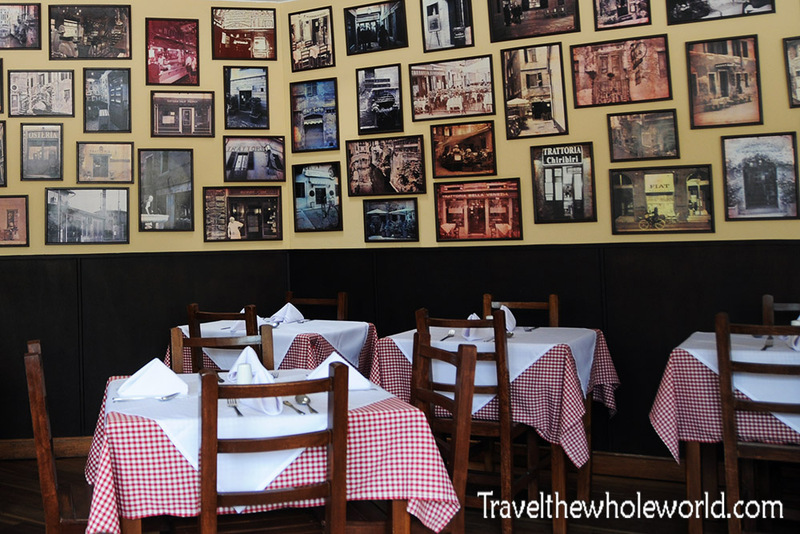 These two photos above and below were from an Italian restaurant I happened to stumble into while roaming the city. The restaurant was nicely decorated and had a great staff. 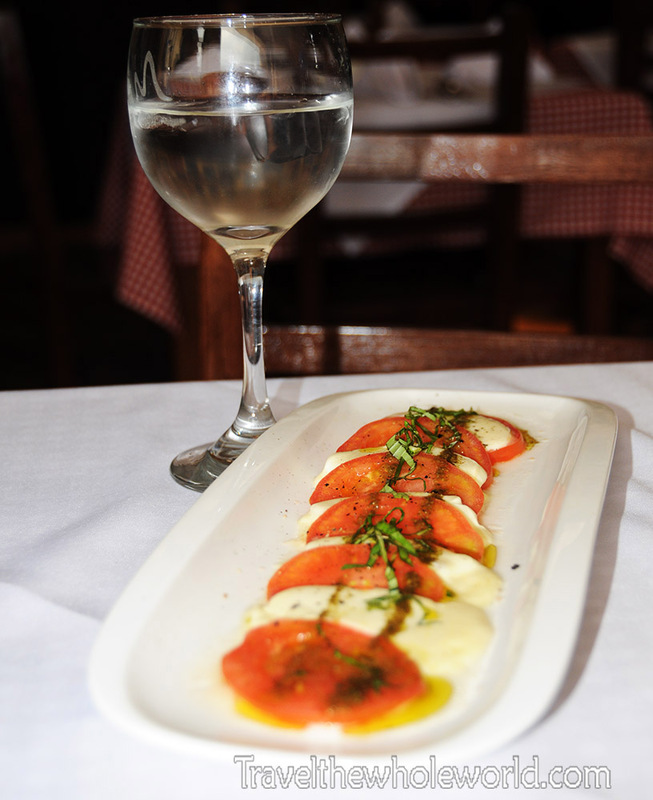 The photo below was just my appetizer which was as good as the meal itself. When dinner was over my waiter showed me to the third floor for a 360 view that overlooked parts of the city. 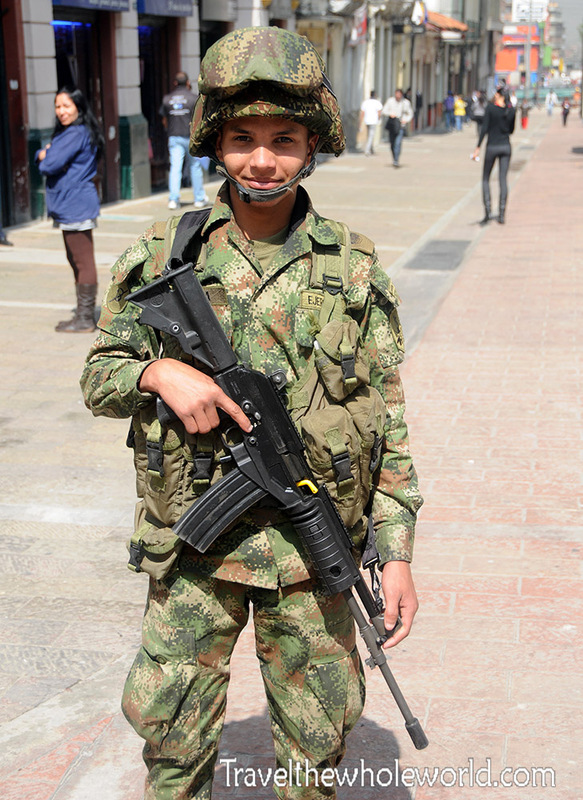 Even though Bogota is now safe I have to admit that my expectations were low. I was pretty surprised to arrive to a modern and clean city filled with colonial buildings that stand in the shadows of towering skyscrapers. Much of Colombia;s turnaround is credited to former president Alvaro Uribe who was in power from 2002 until 2010. His father was killed in 1983 by the FARC guerilla group, and under Uribe’s leadership the FARC as well as other criminals and militias saw many of their leaders killed or arrested. Some of the most dangerous groups lost more than half their numbers from either losing their lives in battles or from laying down their arms and abandoning their leaders. Colombia once had one of the highest recorded murder and kidnapping rates in the world, and those numbers have plummeted in the past decade. There are lots of police and military stationed all over the city when I visited, and since things have continued to stabilize I’m sure their presence is getting smaller each year. Along my random experiences in the city, I came across some people who had set up the two cans and a string trick. I actually have never done this, but the plastic cups they were using seemed to work just as well as cans. I tried to participate in the conversation but since my Spanish isn’t too great it was difficult for me to understand the other guy, but otherwise their little set up seemed to be working well. 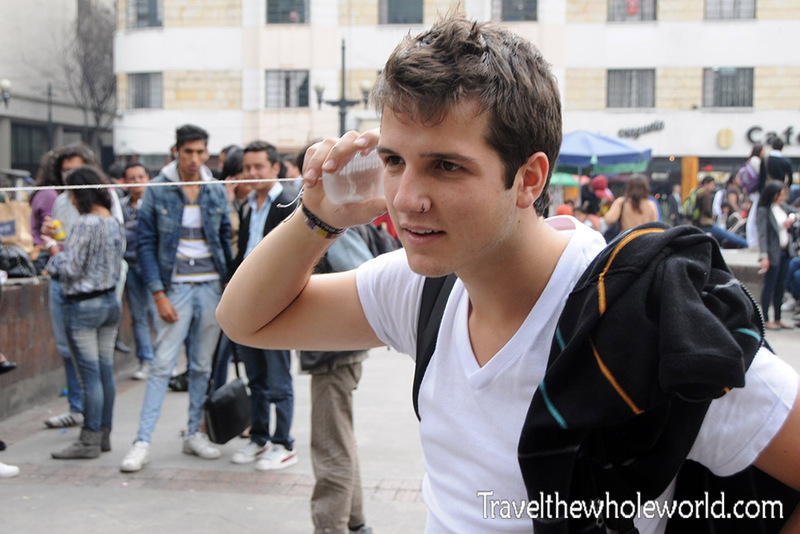 On a side note you might think the Colombian guy below looks more American or European than someone from South America. I saw many people like this all over Colombia, so I wasn’t surprised to later learn that 20% of Colombia’s entire population is white. 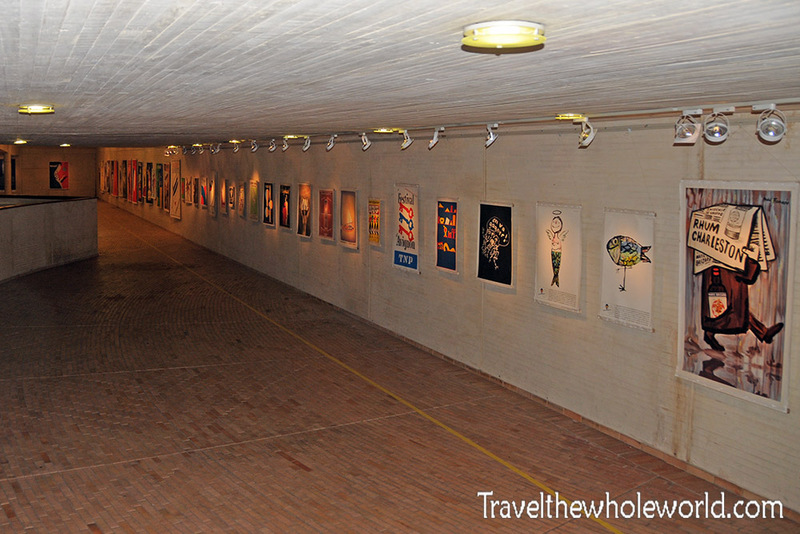 What amazed me about Bogota was all the free museums and art they had around the city. Like I said earlier, I didn’t have high expectations for Bogota but the city certainly impressed me. The photo above shows a wall along a street that was decorated with what seemed to be vintage French advertisements. 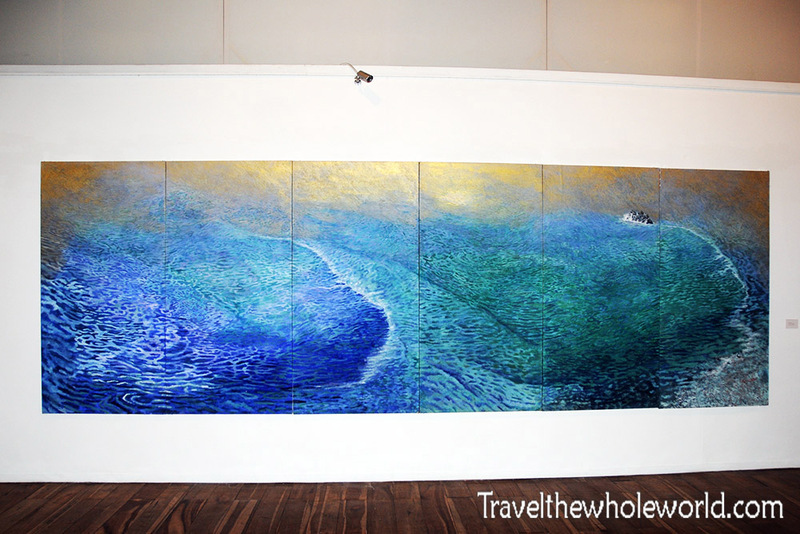 Below is an enormous art painting from yet another free art gallery in Bogota. 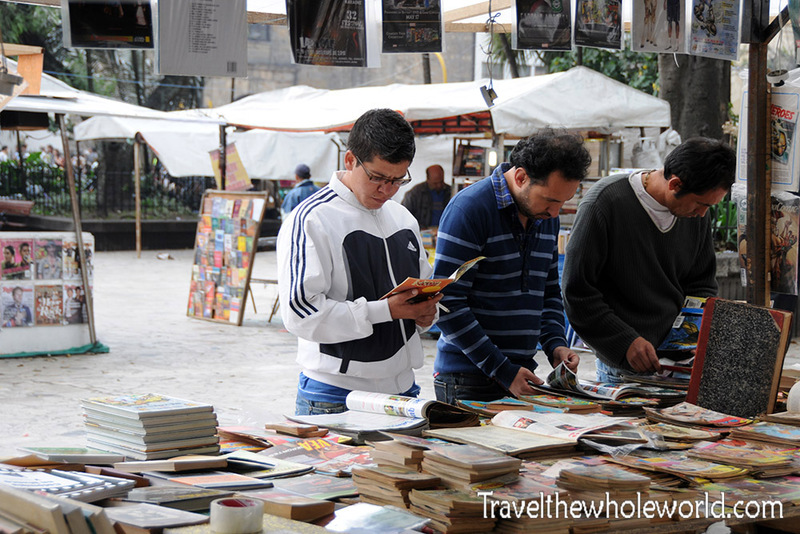 During a walk in another part of the city I also came across a small market that sold mostly books and movies. 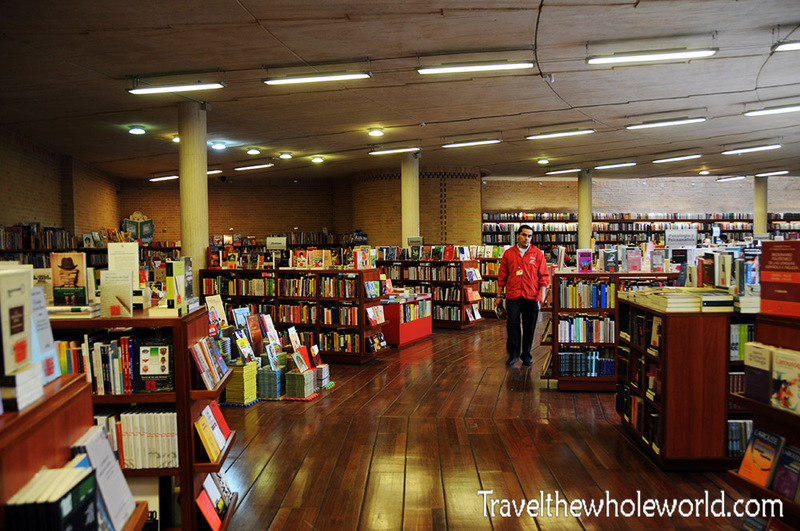 I assume that this huge bookstore below is the largest and nicest in the country! I didn’t realize Bogota was such a large city until my visit to Colombia. If Bogota was part of the United States, it would be America’s largest city surpassed only by NYC in terms of population. 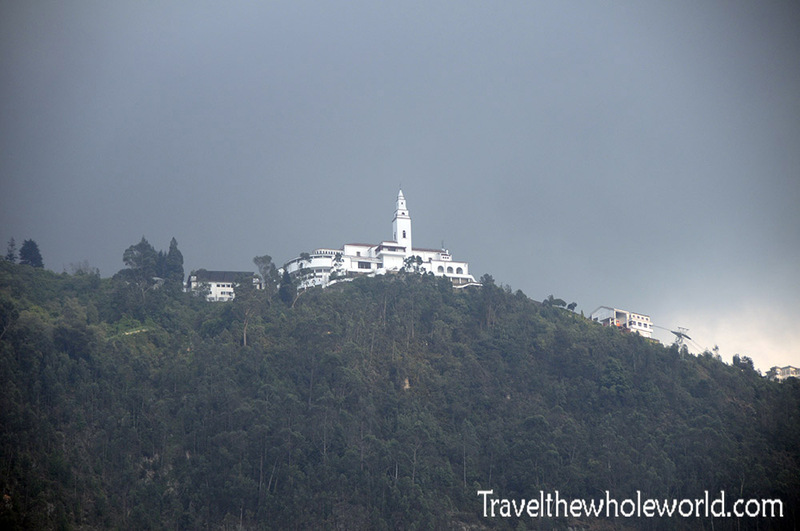 A great place to visit is Monserrate, where you can get some beautiful views of Bogota where these photos were taken. 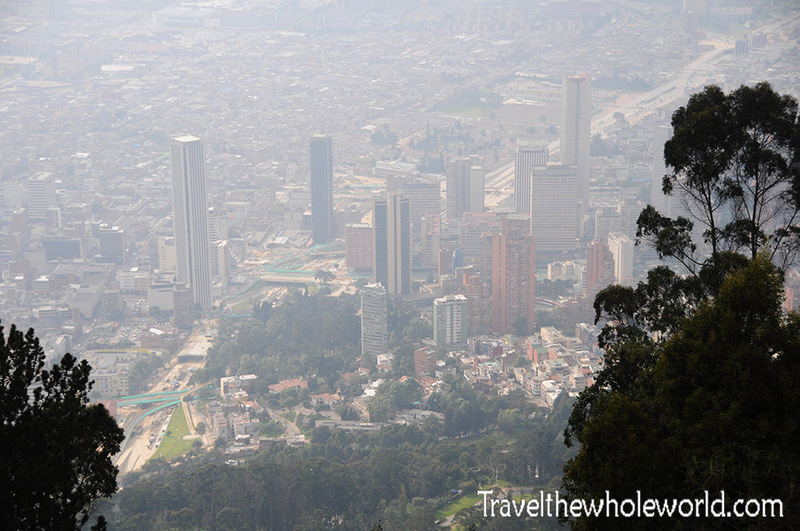 If you spend any time in Bogota you’ll not be able to miss Monserrate in the mountains that surround the capital. 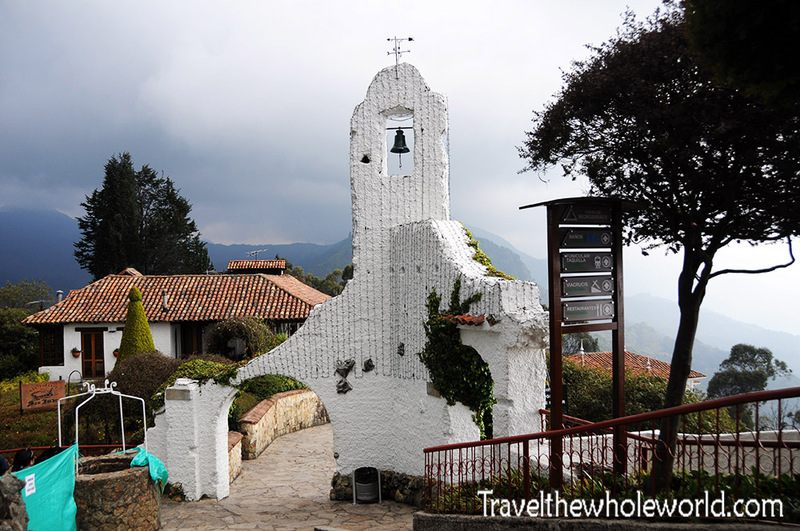 Cerro Monserrate is a historic place that was actually created long before Colombia existed. 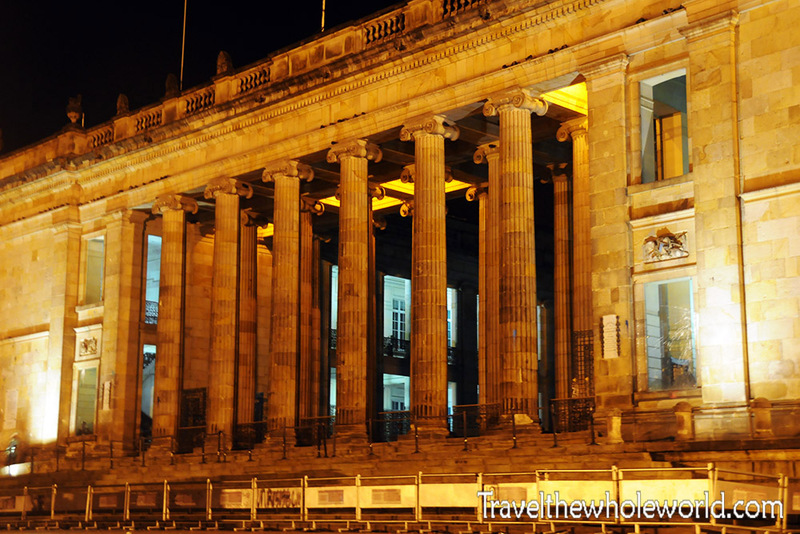 It was built by the governor of the New Kingdom of Granada in the 1600’s. Since the church is on a steep hill and located over 10,000 feet (3,000 meters), a cable car is the most common way of reaching the mountain. Another option is a small train that occasionally rides to the top, or for those looking for a good workout there are also steep hiking trails. 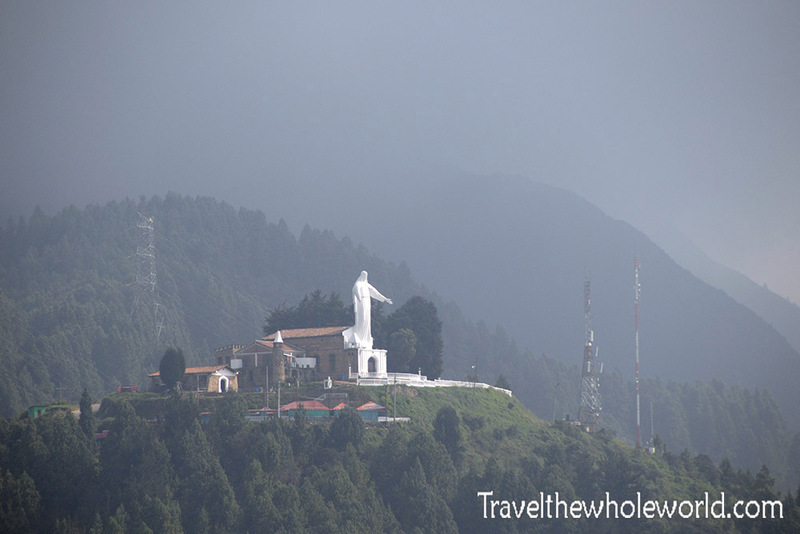 Above is Cerro Monserrate itself, with a large statue of Jesus in the distance that reminded me of Rio De Janiero’s Christ the Redeemer statue. I took the cable car up to Monserrate. Unfortunately there isn’t any perspective here, but this was my first encounter after arriving up the mountain. 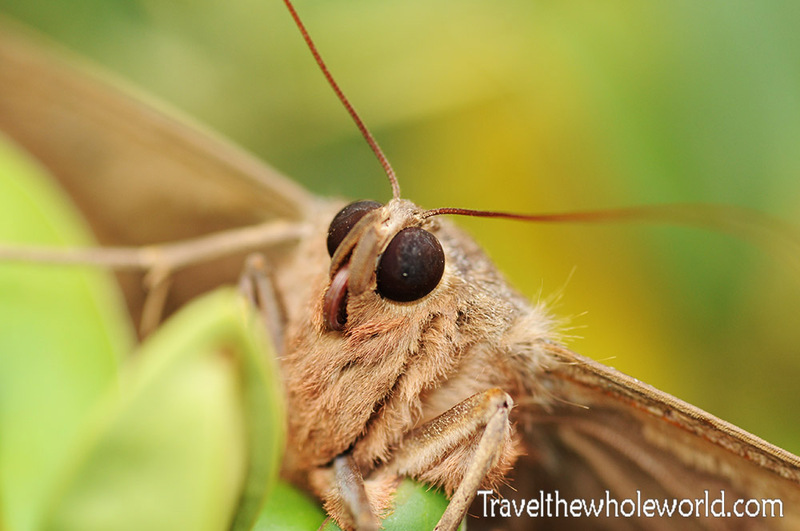 These gigantic moths were the size of my hand, and by far the largest I have ever seen in the world. I was a bit weary of putting one on me so you can see how big they actually were; maybe next time! 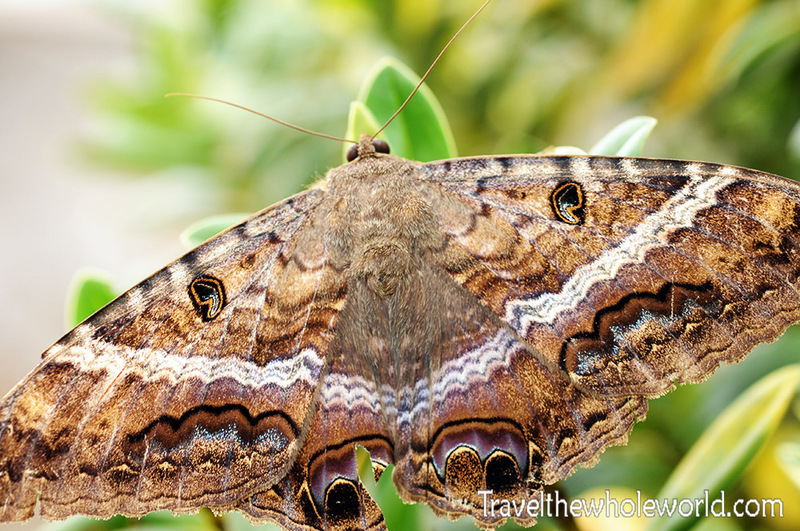 Aside from the gigantic moths, most of Monserrate is a pretty impressive place. There’s actually a lot to do here, and you could easily spend an entire weekend. 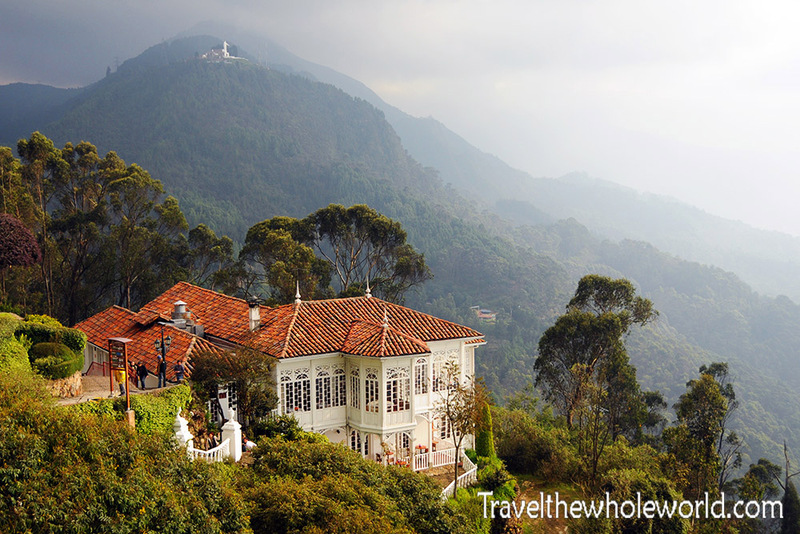 Monserrate has a monastery, along with a few restaurants, gardens, and even hiking trails. I even saw a few locals doing trail running which must have been very challenging at 10,000 feet (3,000 meters)! 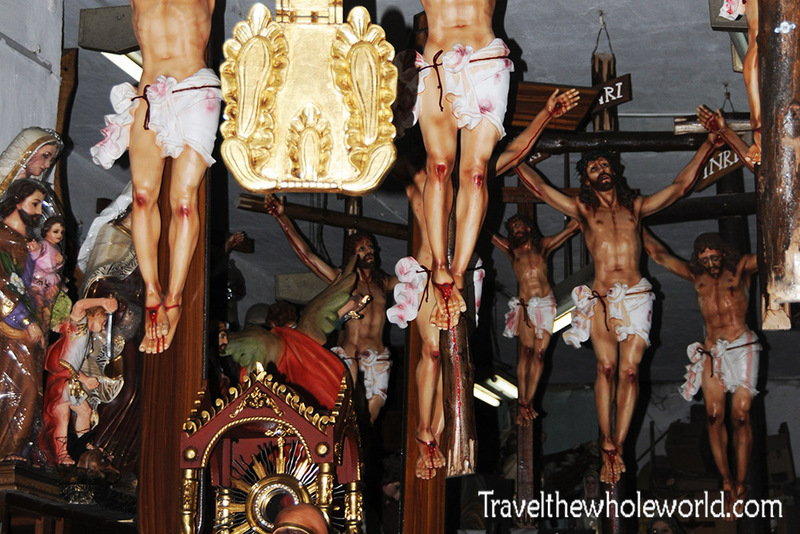 These are two photos from Monserrate’s monastery. 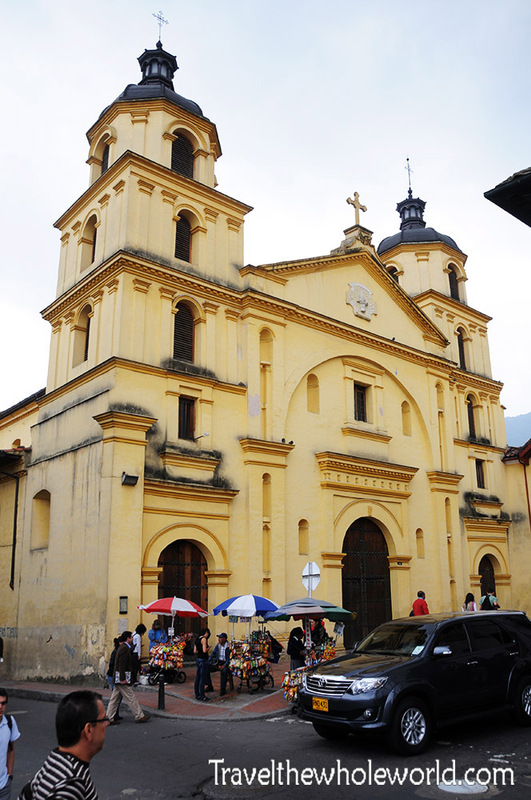 Colombia has always been a Christian country, so within the city and all across the country are churches, cathedrals, and several religious stores. This church I visited was one of many that I stumbled upon in the city. This religious store was located nearby, and I almost felt a bit disturbed with all these Jesus statues hanging from above. 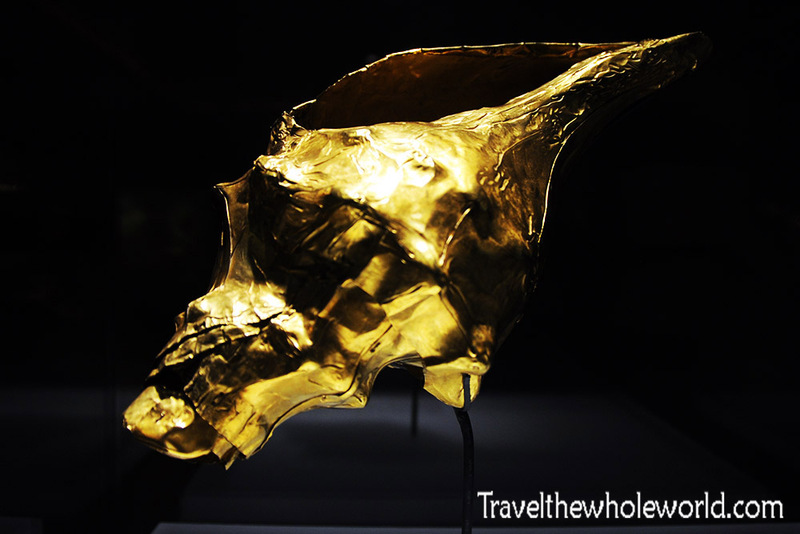 One of the most unique museums that I ever visited was Bogota’s gold museum. 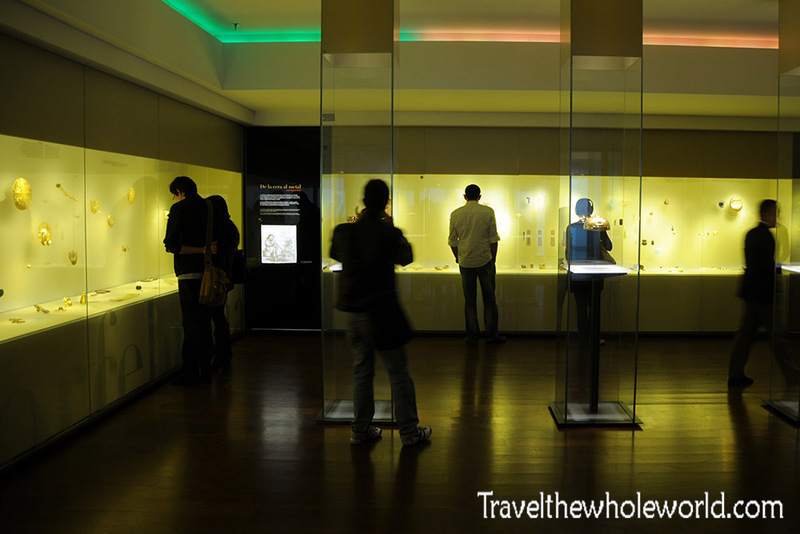 Colombia and South America have several gold museums but the one located in Bogota takes up several floors and is the largest in the world. 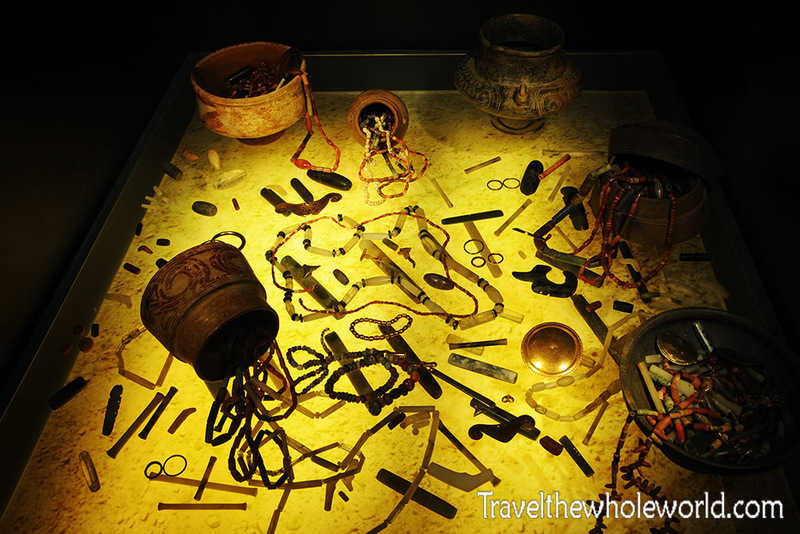 The pre-hispanic gold was created by different South American tribes and there is an incredible 55,000 pieces of gold in the museum with over 6,000 of those on display. Above is a photo of the inside of the museum. 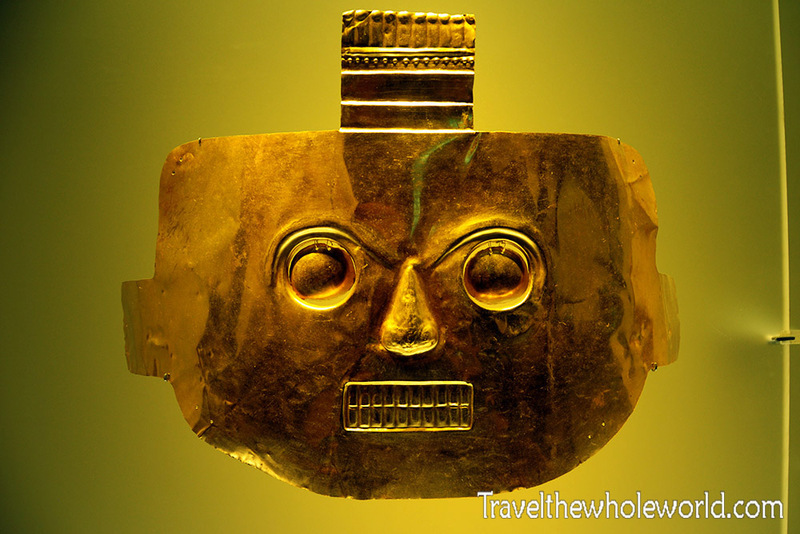 The golden mask below was created by natives and was once used to cover the faces of the dead. This golden seashell is one of the most famous artifacts from the gold museum. This was of course created by lining a seashell with gold, but that has since eroded away leaving only the gold encasing intact. I imagine this sole piece of gold art would probably be able to pay for my remaining expeditions, or any one of these golden trinkets below. 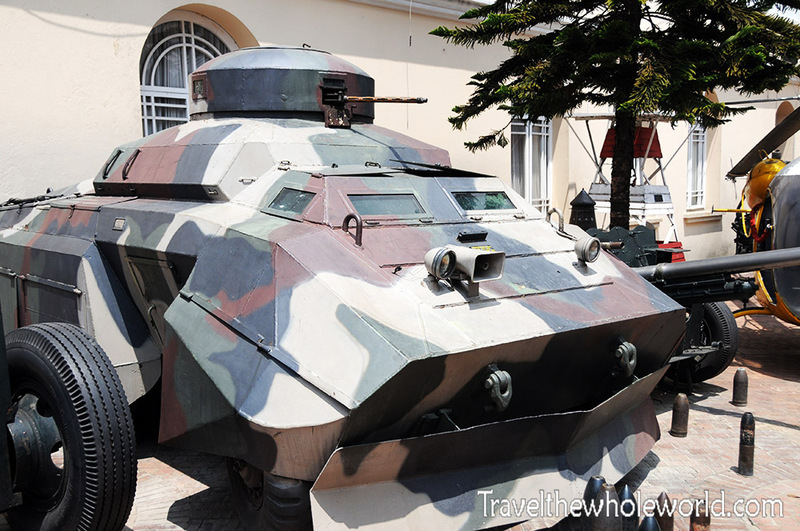 Another museum that’s nice to visit and is even free is the museum of military history. 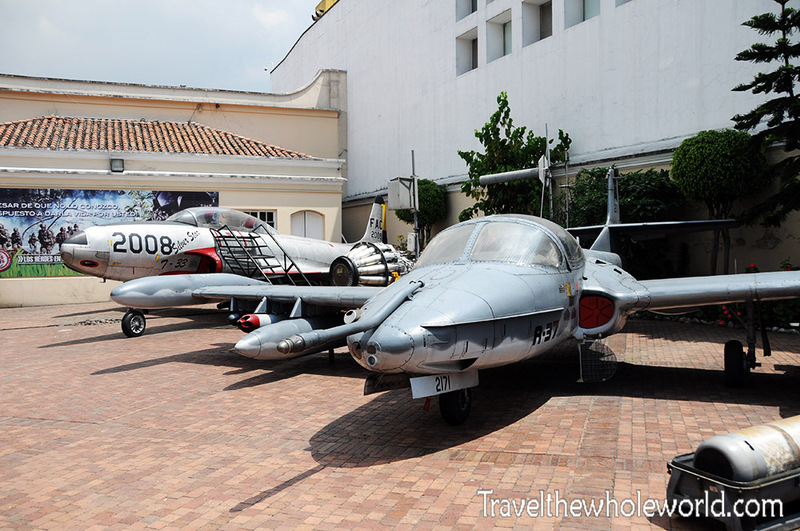 The museum covers Colombia’s battles from its revolutionary war to modern times. 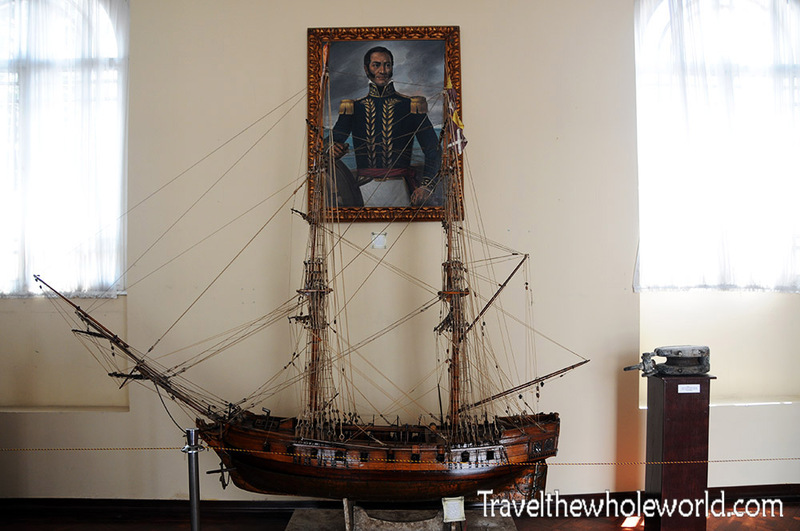 This portrait above shows Jose Padillo and a model of one of his ships during the Spanish Revolutionary War. At the time of Colombia’s revolutionary war, its borders were much larger and included parts of Panama, Venezuela and Ecuador. Jose Padillo was seen as the father of the Colombian Navy and was famous for defeating the Spanish in the Battle of Lake Maracaibo. After Colombia was independent, the nation further split at the turn of the 20th century. What’s known as the 1,000 year war occurred when Panama fought Colombia for independence. The name comes from the fact that no one expected the war to last so long, and eventually other countries pressured both sides to end the confrontation. This included the United States who was supporting the construction of the Panama Canal at the time and wanted to protect its investment. 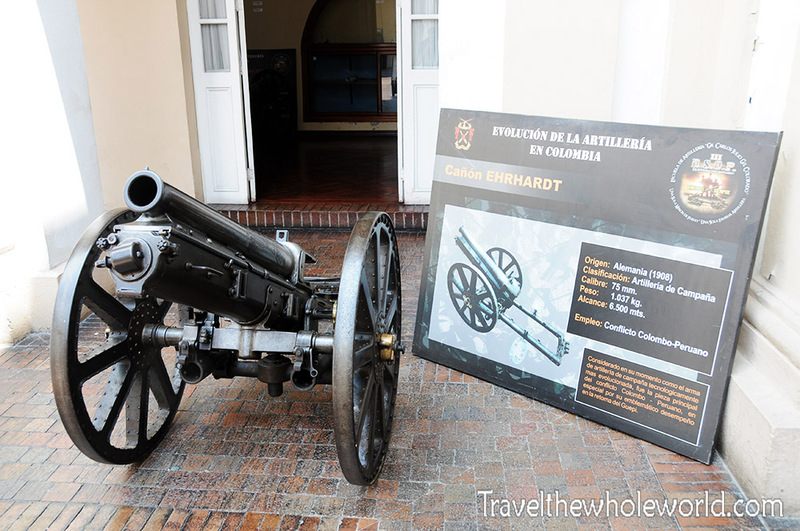 The photo below shows a cannon from the 1,000 year war. The military museum is pretty large, and even includes multiple floors. I wish I took more photos of the smaller and historic items that were on display, but it seems I focused on some of the bigger military equipment. Above and below are war machines from the 1960’s and 70’s.